All new and original to this anthology, the twenty-one stories in Dangerous Women include work by twelve New York Times bestsellers, and seven stories set in the authors' bestselling continuities-including a new "Outlander" story by Diana Gabaldon, a tale of Harry Dresden's world by Jim Butcher, a story from Lev Grossman set in the world of The Magicians, and a 35,000-word novella by George R. R. Martin about the Dance of the Dragons, the vast civil war that tore Westeros apart nearly two centuries before the events of A Game of Thrones. Also included are original stories by Brandon Sanderson, Joe Abercrombie, Sherrilyn Kenyon, Lawrence Block, Carrie Vaughn, S. M. Stirling, Sharon Kay Penman, and more. 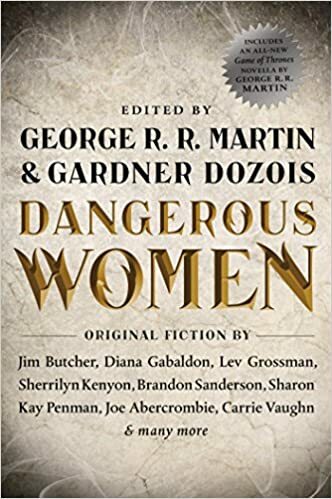 Writes Gardner Dozois in his Introduction: "Here you'll find no hapless victims who stand by whimpering in dread while the male hero fights the monster...Instead, you will find sword-wielding women warriors, intrepid women fighter pilots and far-ranging spacewomen, deadly female serial killers, formidable female superheroes, sly and seductive femmes fatale, female wizards, hard-living Bad Girls, female bandits and rebels, embattled survivors in Post-Apocalyptic futures, female Private Investigators, stern female hanging judges, haughty queens who rule nations and whose jealousies and ambitions send thousands to grisly deaths, daring dragonriders, and many more." tree than me? I helped her plant the damn thing!” “Don’t you think we’d put her in a home if we could afford one? Do you think I like living like this?” Robbie’s wife had shouted at the neighbor. Then she had burst into tears and finally managed to tow Linda back inside. And now Linda was out in the foggy night, staring at Sarah with round wild eyes. The wind was blowing through her white hair, and leaves rustled past her on the pavement. She wore a pink running suit and her bedroom slippers.